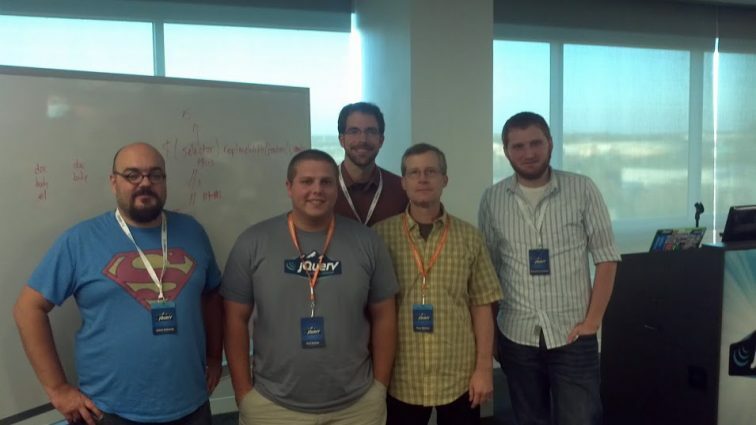 This week, I had the privilege of attending the first ever jQuery Developer Summit. I spent two full days hacking jQuery and collaborating with the jQuery team and community to squash as many bugs as possible. The Summit was held at the AOL campus in Dulles, VA. Yesterday, we kicked off the Summit with several brief presentations from various jQuery team members and discussed the goals for each table. After this, we jumped into code head first. Dave Methvin, president of the jQuery foundation, was at Table 2 leading the bug assignments and assisting us whenever possible. The bug I was assigned to fix (#12519) branched into many other conversations that made us question the design principles of the correlated code that the bug referenced. After rationalizing the best way to address these issues with Dave and several jQuery members, we finally decided on a solution. I committed the changes Tuesday morning and my pull request was approved shortly thereafter, representing my very first jQuery core patch on behalf of 10up! I’m looking forward to continuing to contribute to the jQuery community and to exploring new ways to integrate advanced jQuery solutions into WordPress.